With 27 years of experience in adventure tourism, Marie-Christine had a very early start in the field. She started paddling when she was only three years old and, at the age of 9, became the youngest employee of Arpin Canoe Restigouche under the supervision of her father, who owned the company at the time. Lovingly referred to by her team as the “Boss des bécosses” (which we could loosely translate to “The Big Boss” or “Queen-Bee”), this passionate young woman can even make her canoe dance on water! And don’t even try to get her to leave the Kedgwick forest: this smart and savvy businesswoman, with wind in her sails and her beloved river running through her veins, is no city-girl! You know that kind voice you hear over the phone when you call our number? That’s Louise! Since 2014, her vast organisational knowledge, detail-oriented mind and warmth have made her an irreplaceable ally. She will be happy to guide you towards the right package to book. Affectionately called the “Minister of Finances”, this wizard of numbers is also a social media, and will answer all of your questions on our social media platforms. Rémi joined our company in 2015. Nicknamed “Le barbu” (The Bearded One), he quickly showed us the extent of his multiple talents. Not only is he a brilliant cabinetmaker, Rémi also crafts his own oars, cooks on campfires and knows how to keep you safe – and save your life – on the river! Dominc is better known as The Ninja! Bright eyed and passionate, you will be swept away by this guide’s thirst for life and exquisite chili! Being a martial artist, you might even get a glimpse of him training while you’re taking a break on dry land. But don’t be scared: he’s still as chatty as he was back in his radio days! Our beloved Historian is the one who will safely bring you back to your vehicle after your exciting journey! As he is quite the character, he may regale you with tales from the Kedgwick Hotel – of which he is now the owner – or just try to make you laugh after those long paddling hours spent on the river. Although he is an avid collector of local stories, antiquities, and river rocks, his true passion is transport security! So don’t worry, you’re in good hands! The perfectionist amongst our employees, this Management student at the Université de Moncton not only tackles anything we throw at him, he crushes it! That’s how he got his nickname The Lawnmower Master in 2016: because he couldn’t stop at cutting the lawn, he had to sculpt it in the shape of our logo! We are happy to answer your questions all year round! 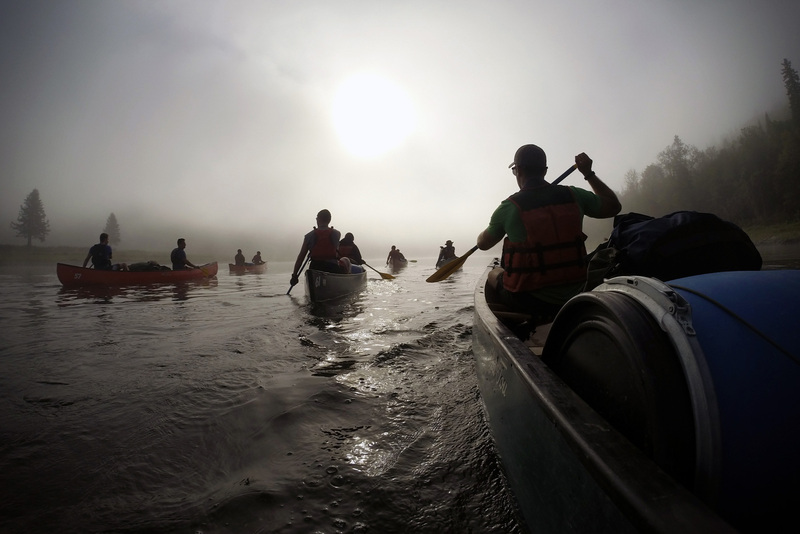 Arpin Canoe Restigouche's season begin on May 15 and end on September 30.